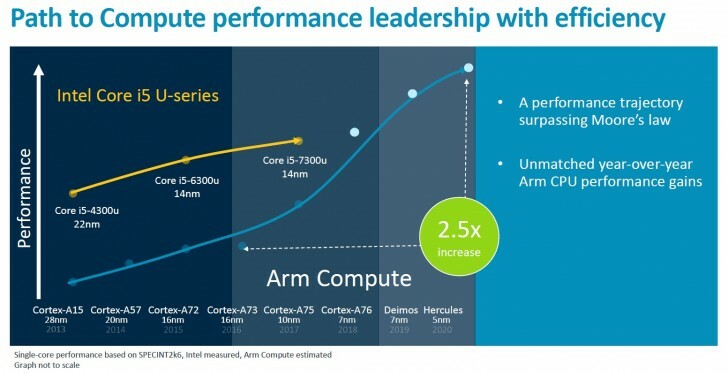 Earlier this year ARM unveiled the Cortex-A76, which promised 35% boost in performance. This core will be out later this year, but there’s much more to come – the company announced a road map for 7nm and 5nm cores and is not shy about making comparisons with Intel. The A76 will be made on both 10nm and 7nm nodes. Its followup, codenamed Deimos, will be made on the 7nm node once it matures. Expect to see this in devices in 2019 with a 15% increase in performance over A76. The sequel to Deimos is Hercules and it will be made on both the 7nm node and the yet to be developed 5nm node. Hercules should be 10% faster than Deimos on 7nm and faster still at 5nm. When all these improvements are stacked up, a 5nm Hercules core should be be 250% faster than a 16nm Cortex-A73 core. But that’s a couple of years away. 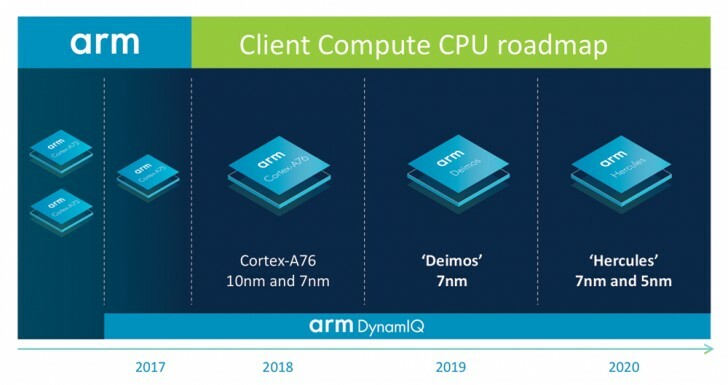 ARM expects Cortex-A76 to match an Intel Core i5 7300U in single-threaded performance while using less power – 15W TDP for the i5 and “under 5W” for the A76. The press release leaves out some vital details, though. The 7300U includes a dual core processor and a GPU in that TDP, ARM doesn’t say how many cores a Cortex-A76 design will use (and whether the TDP includes the GPU). Also, the 7300U is from 2017, Intel is getting ready to launch its 9th generation Core processors. Still, ARM’s goals are clear – to break the dominance of Intel-powered laptops, both the Windows-powered ones and the Chromebooks. Asus, Lenovo and HP are making Snapdragon-powered Windows 10 machines and Samsung will be joining them soon. I know that the user I highfived is MUCH taller than I am. I mean why did you feel the need to mention it out of nowhere? Just curious.